Save your fine-feathered friends from conniving cats in Bird's Town, an entertaining endeavor suitable for the entire family. If you like this free game, try Shark Attack. Mischievous cats are hypnotizing birds and luring them into their traps, but one brave bird is fighting back. Help him save his pals before they march to their doom in this fanciful marble shooting game filled with colorful graphics, upbeat music, and hilarious comic book interludes. Make groups of three or more like-colored birds to collect them in over 120 taxing levels. Use incredible power-ups, collect gorgeous gems, and earn a wealth of coins. With your riches and feathered construction workers, you can then build a wonderful and safe bird haven for all of your new friends to live in. 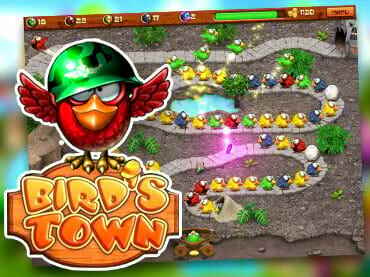 Download free full version of Bird's Town today! Free Game features: - Keep little birds from marching to their doom in this entertaining Match 3 challenge; - Shoot to match like-colored birds in over 120 exhilarating levels; - Use incredible power-ups, collect gorgeous gems, and earn a wealth of coins; - Play mesmerizing mini-games and avoid the conniving cats; - Help your friends construct a wonderful and save bird haven. If you have questions about Bird’s Town game, please contact us using this form.